Torticollis: Differential Diagnosis, Assessment and Treatment, Surgical Management and Bracing fulfills a need, long overdue. 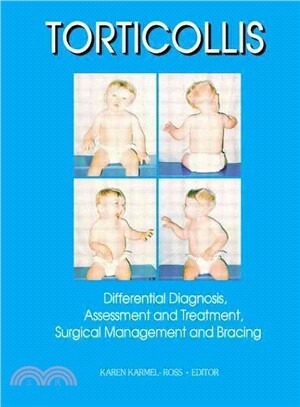 To provide pediatric physicians, orthopedists, surgeons, physical therapists, occupational therapists, and family physicians with a systematic approach to the assessment and treatment of congenital muscular torticollis, this important guidebook gives you vital information on torticollis and its impact on the growth and development of children. Underscoring the importance of early intervention, Torticollis covers the differential diagnosis of this disorder, its conservative management, the advantages of a team approach to management, the selection of appropriate treatment techniques and pathways, and the relationship between torticollis posture and development of postural control and balance. Torticollis teaches you how to detect torticollis early and differentiate nonmuscular torticollis etiology. You will also learn how to evaluate the entire musculoskeletal system, how to assess motor development, postural control, and balance, and how to develop an exercise treatment plan. Nowhere else will you find such a comprehensive overview of this disorder, the challenges it presents, the progress that has been made, the interventions that work, and the research that needs to be done!